For information on ad space and placement, please review the information below or contact us for details. All advertising is based on time placement. No banners rotate out and maintain in the same location during a campaign. Monthly pricing is noted with each banner below. We accept all major file formats: GIF, JPG, PNG, SWF FLV. 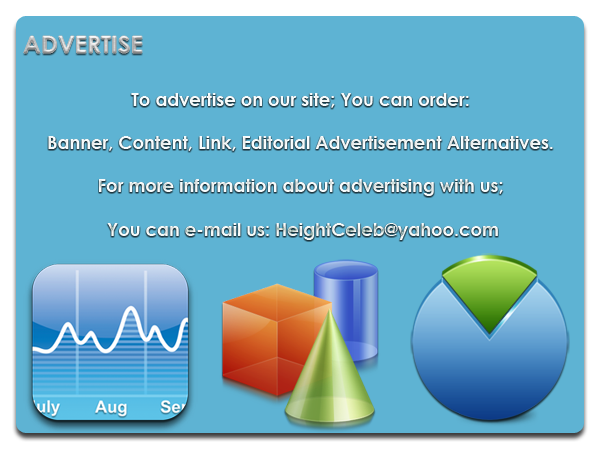 By advertising on HeightCeleb.info, you agree to our terms and conditions listed below. CORPORATE ADVERTISING TERMS - HeightCeleb.info shall not be held responsible for grammatical errors, typographical errors, or errors in artwork provided by the advertiser. All rates are agreed on before advertisement is placed. Advertising is placed on a first-come-first-served basis. ADVERTISING REFUND POLICY - No refunds, all sales are final. ADVERTISING STATS - All stats are estimated and may vary depending on campaigns, holidays, acts of war or other controlling or non controlling situations. No detailed reporting, It is up to the advertiser to track their own clicks and banner stats. No guarantees are provided for advertising results.